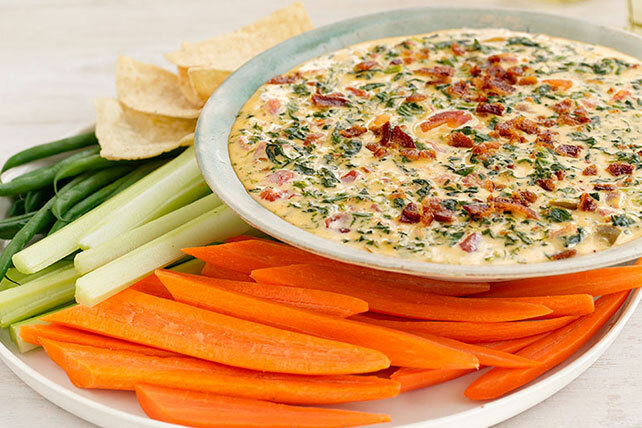 Kick off your next party or Thanksgiving dinner with our Cheesy Spinach and Bacon Dip! Chilies bring the heat to this delicious spinach and bacon dip. Serve with tortilla chips and cut-up fresh vegetables. Cut ingredients in half; combine in microwaveable bowl. Microwave on HIGH 3 to 4 min. or until VELVEETA is completely melted and mixture is well blended, stirring after 2 min. Serve as directed. Makes2 cups or 16 servings, 2 Tbsp. each.